Jan. 4, 2019 – Back from the holidays refreshed and ready, Square Circle New York hits the ground running! Happy New Year to everyone and all the best for what will turn out to be yet another great year! Many of you have most of your goals set to smash for the new year and we will be here to help you meet them! TAKE INITIATIVE and realize your plans to set into motion! Let’s get it! First up, we have an updated class schedule to start off the new year! 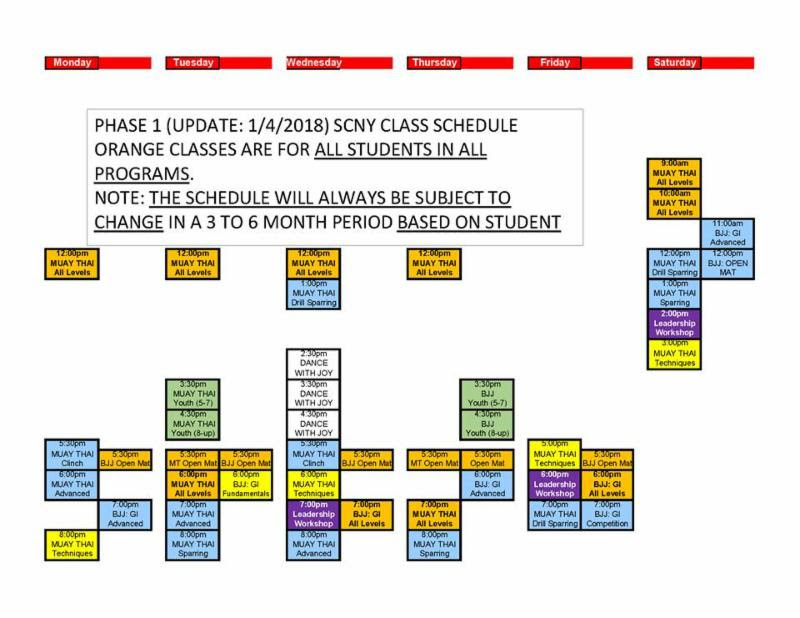 Make sure to review the new class schedule as some classes have shifted to other time slots. Group classes will either stay or rotate on the schedule based on attendance so we can keep providing classes in the time slots that everyone wants. New Brazilian Jiu Jitsu blue belt promotions from coach Aldrin Soedarto to start off 2019 belong to Frantz Jeanty, Jorge Cardoso and Chris Lewis! Congratulations to all three! The next Muay Thai smoker interclub will be January 19, 2019 and it will be held at Chok Sabai. Event time is 3pm – 6pm and the location is 1 West 30 street at Fifth Avenue. SCNY athletes already matched and confirmed are Justin Taylor and Daniel Apasewicz. Admission is $10 at the door – come out and show your support! There are several Muay Thai and BJJ events happening in the next few months so stay tuned for further announcements! This year is getting started in the right direction! Lots of great things happening in 2019! SCNY’s Kenny Narcisse Wins His Amatuer Muay Thai Debut at Madison Square Garden! Dec. 8, 2018 – Square Circle New York athlete Kenny Narcisse made his amateur Muay Thai debut this evening at one of the most revered venues for combat sports: The Hulu Theater at Madison Square Garden! Kenny’s opponent was clearly the taller and larger athlete during the weighins, but real test is always in the ring. 3 rounds of action and the judges’ decisions were in favor of our athlete Kenny! Huge thanks to Triumph Kombat for providing the opportunity for the challenge. 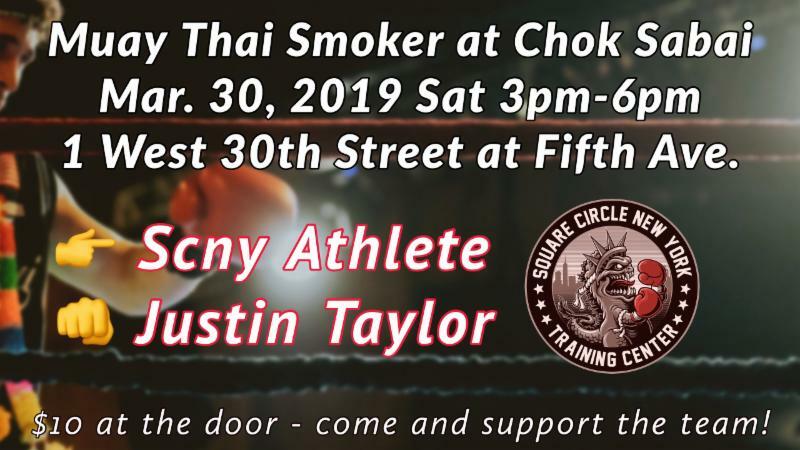 SCNY Athletes Set to Participate in Chok Sabai Muay Thai Smoker Sat. Nov. 10! Nov. 09, 2018 – The next Muay Thai Smoker/Interclub will be held at Chok Sabai tomorrow Saturday November 10th at 3:00pm! Two of our athletes, Daniel Apasewicz and Kenny Narcisse, will participate in the event and it will be a good turnout of different schools with their athletes as well. Chok Sabai is located at 30th Street and Fifth Avenue. The event will be from 3:00pm to 5:00pm and there is a $10 cover at the door. 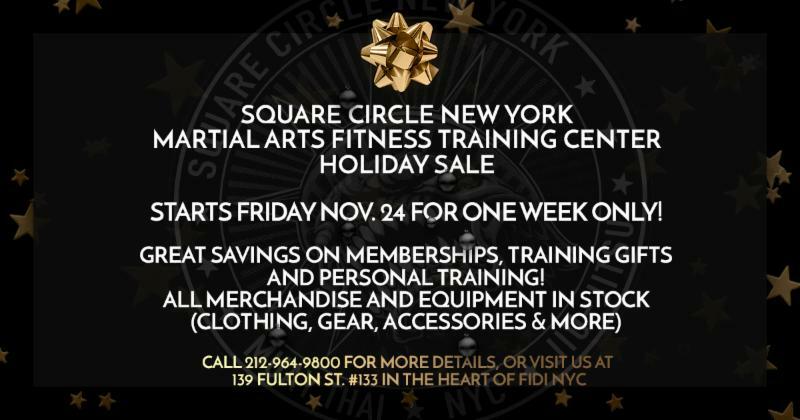 Square Circle New York will close at 2pm to give everyone enough time to get to the interclub event. Hope to see you all there! Jul. 23, 2018 – The next Muay Thai smoker / interclub is this Saturday July 28th and will start at 3pm sharp at CHOK SABAI and their address is 1 West 30th at 5th Ave. There is a small cover charge of $10 for all guests. 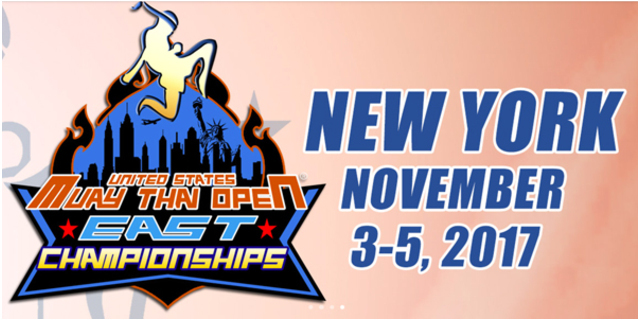 SCNY athletes Liam, Kenny, Shimpei and Tiger will all represent the school at this event! Scny Training Center will CLOSE EARLY on Saturday at 12pm after the BJJ No Gi class to ensure that we will be prepared and arrive on time! Taste of the Seaport Sat. Oct. 20 – Square Circle New York Joins this Event! Oct. 18, 2018 – The 9th annual food, music and entertainment event Taste of the Seaport will be hosted on Piers 16 and 17 in the South Street Seaport area in our FiDi neighborhood. The main feature will be the food offerings from many of the local restaurants along with additional local businesses featured from the community. This community event will benefit the local public schools Peck Slip PS 343 and Spruce Street PS 397. Our booth will be located at Pier 16, Booth #47. A map of the event layout is attached. For all visitors, we will have a Prize Wheel with items to win such as free t-shirts, free exercises, free week of training and more! Only non-SCNY members that have never trained with us are eligible to spin and win prizes! We will have live demos/padwork in Muay Thai and Brazilian Jiu Jitsu in both adult and youth settings. Each demo session will informally last around 15 minutes before transitioning into the next one. A few of our coaches will be in attendance at different points during the event training and holding pads for Muay Thai, or demonstrating basic guard positions or basic submissions for Brazilian Jiu-Jitsu. 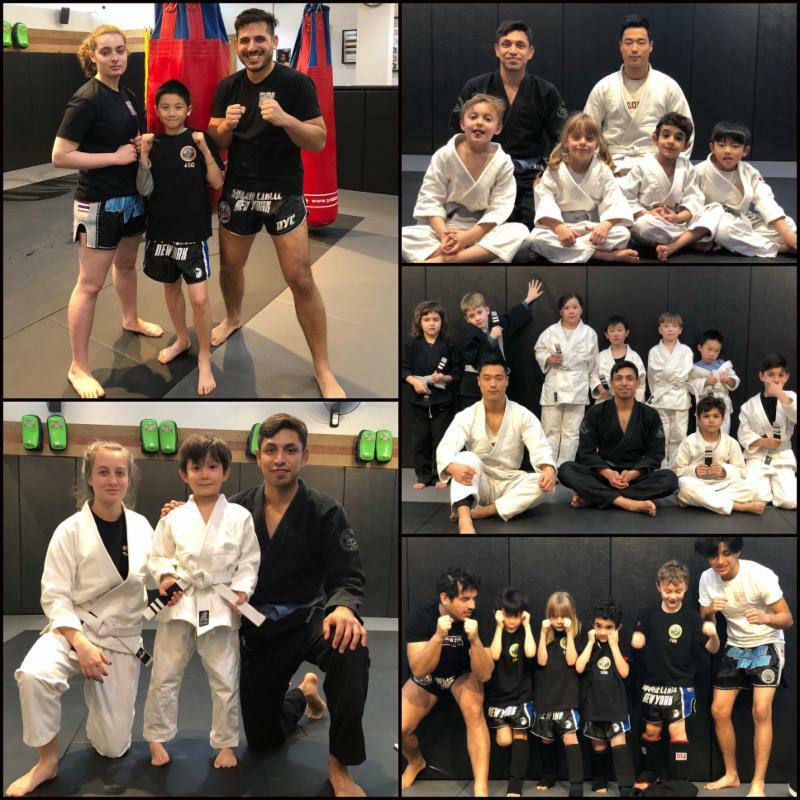 Youth Brazilian Jiu Jitsu class will take place from 12:00pm – 12:30pm, and Youth Muay Thai class will take place from 1:00pm – 1:30pm. Parents, please note: the classes will be more of a demonstration of the core values and light technical work because we have very limited space. If you plan on attending, please have your child show up with their appropriate uniforms. Both classes can end early or go over a few minutes. In addition, please have their change of clothes ready in case they need to change to regular casual street clothes. We encourage all our students to contact us with times and availability that want to participate in the demos or volunteer to assist us at our table with basic Q&A from inquiring individuals or with the Prize Wheel. We are planning to have a 10’ x 10’ mat area in front of our booth to accommodate the demos. If you wish to help us set up, you can meet us at SCNY at 10:00am and help us bring the materials over to our booth, or you can meet us at 10:30am at our booth. We are happy to have help from anyone that is interested! Call us at 212-964-9800 at the school for more information. Hope to see you all there! SCNY Training Center New Location 80 Nassau Street! Soft Opening January 8, 2018! Jan. 6, 2018 – It’s been over a week since you last trained and it’s time you dust off your gloves and Gi’s! Our soft opening is next Monday, January 8th at 12pm. Looking forward to having everyone back! We’re so excited to announce that we are finally in our new space at 80 Nassau Street in the lower level! Thank you again for all of your patience and a special thank you to everyone who volunteered last weekend to assist us with the move. We couldn’t have done it without your help! In the first phase of our class schedule, we are keeping almost the same schedule as before. The only exception is that adult evening group classes are on the hour instead of the half hour. As mentioned above, this is a soft opening. That means that our training center will not be at 100% capacity when you show up next week. We will still be working towards that goal, so please be patient with us. We are accepting early pre-enrollments before we are at full operating capacity! Call 212-964-9800 or email info@squarecirclenewyork.com for more details on early enrollment and huge savings! We are located in FiDi in the heart of lower Manhattan where every major train stops! Nov. 20, 2017 – It’s the most wonderful time of the year – Our Annual Winter Holiday Sale is back! The 2017 Winter Holiday Sale will last for one week beginning on Friday, November 24th at 12pm. We’re spreading the joy with BIG savings on memberships, training gifts, personal training, merchandise and equipment in stock (clothing, gear, accessories and more). On the first day of the sale, November 24th, we’ll be offering additional discounts to celebrate Black Friday! More details will follow shortly! Be sure to stop by the school with your wish list and take advantage! Please see the front desk to advance register for the Black Friday classes and more information about what uniform or gear is required. We hope you are able to come in (or call in) before the sale ends! If you have any questions or comments please let us know. 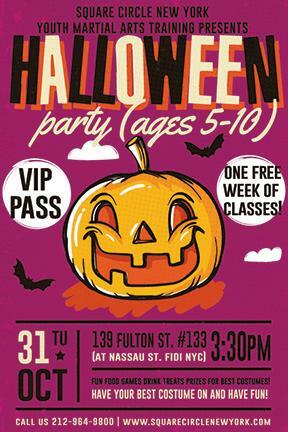 Monster Muay Thai OPEN Classes on Halloween at Square Circle New York! Oct. 30, 2017 – For Halloween tomorrow, Square Circle New York will have OPEN classes for all students, guests and visitors. 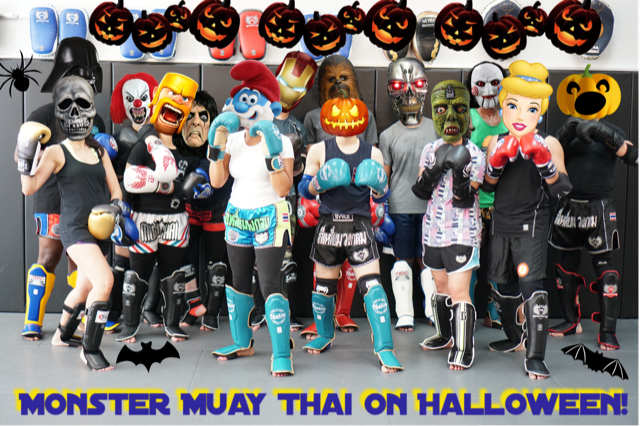 Bring a mask or costume for Monster Muay Thai! Muay Thai group classes are scheduled throughout the day so please call our front desk for more details. Martial arts training is for everyone! We are conveniently located at 139 Fulton St. at Nassau St. in the heart of FiDi! Call us 212-964-9800 to set up your trial classes! Oct. 30, 2017 – On Tuesday, Oct. 31, we are having our own SCNY youth Halloween party! All youth students are encouraged to bring their friends and dress up in costumes! Youth visitors are welcome to join in the fun as well! Prizes and awards for Best Costume, etc. Prizes, games, food and fun! In order to be eligible for awards and prizes, all SCNY students must bring a guest that is not a current student! Our Halloween party starts at 3:30pm with basic techniques followed by fun, games, contest and treats. Our party will promptly end at 5:00pm. Please call the front desk 212-964-9800 and let the staff know that you are attending and bringing a guest to our fun Halloween event! A Big Thank You to the Families at the Leman Prep School Halloween Event! 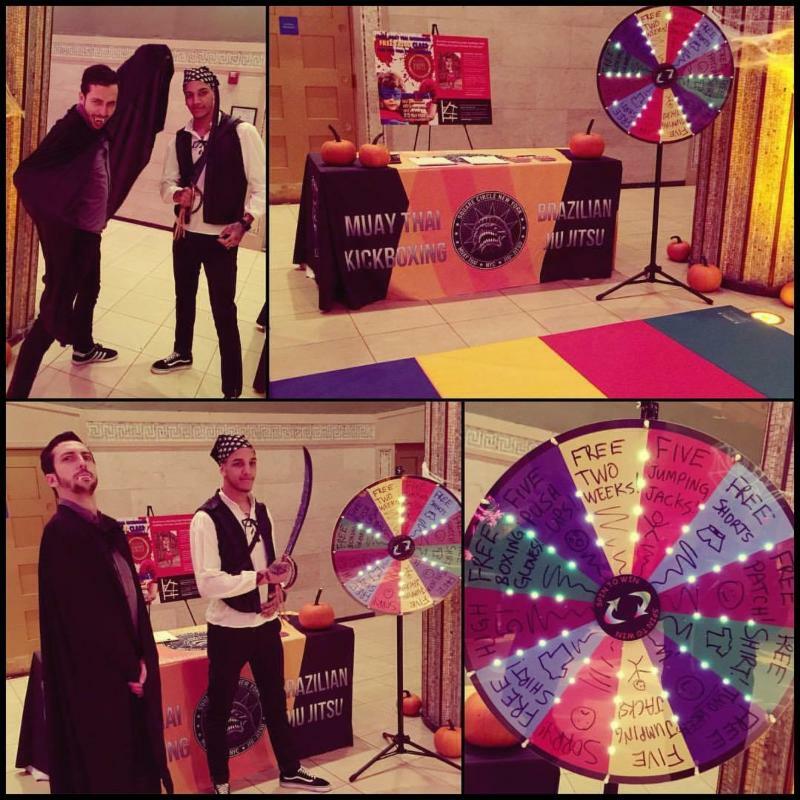 Oct. 29, 2017 – Thank you Parents and Youth for visiting our table at the Leman Preparatory school’s annual Halloween Bash! 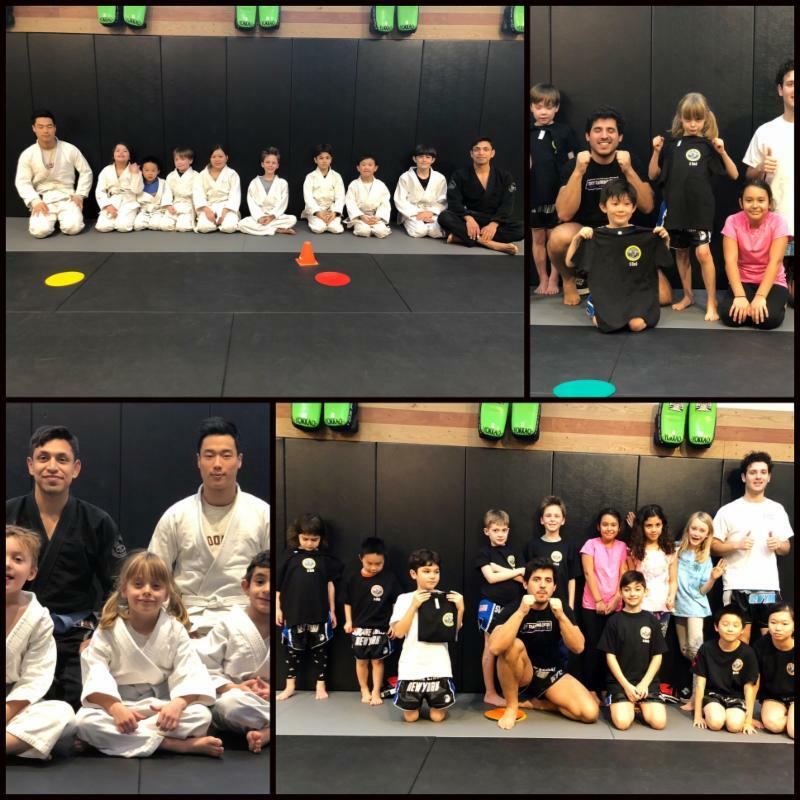 We hope that our staff members Kerry and Vlad were able to answer all your questions about our youth martial arts program. For those that have won a prize, feel free to stop by our location to redeem your voucher at 139 Fulton Street (cross street is Nassau street), Suite 133. 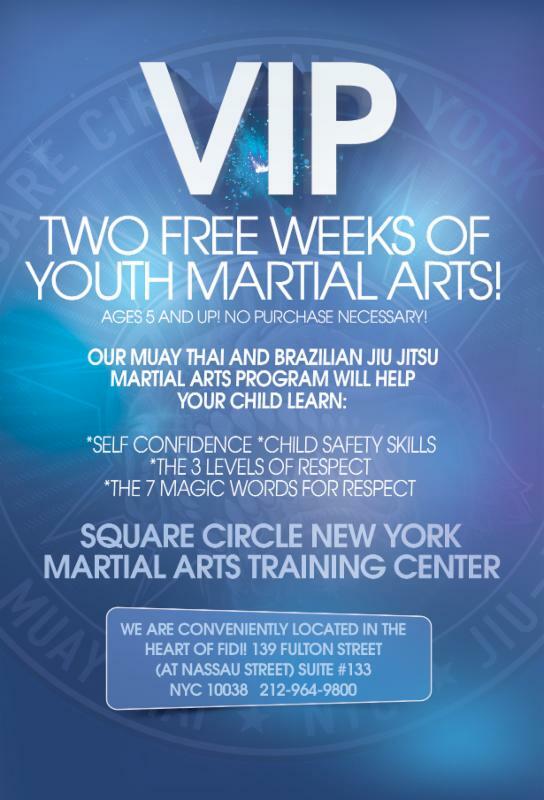 Please check your goodie bags and in it you will find a VIP pass for 2 complimentary weeks of youth martial arts for ages 5 and up, no purchase necessary! We have attached a photo of the flyer below for more information. Just as a reminder, on Tuesday, Oct. 31, we are having our own SCNY youth Halloween party! All youth students are encouraged to bring their friends and dress up in costumes! Prizes and awards for Best Costume, etc. Prizes, games, food and fun! In order to be eligible for awards and prizes, all SCNY students must bring a guest that is not a current student! Our Halloween party starts at 3:30pm with basic techniques followed by fun, games, contest and treats. Our party will promptly end at 5:00pm. We encourage all our youth students and their families to attend! Please call the front desk 212-964-9800 and let the staff know that you are attending and if you are bringing a guest to our fun Halloween event! SCNY Youth Pizza Party Tuesday Sep. 26! 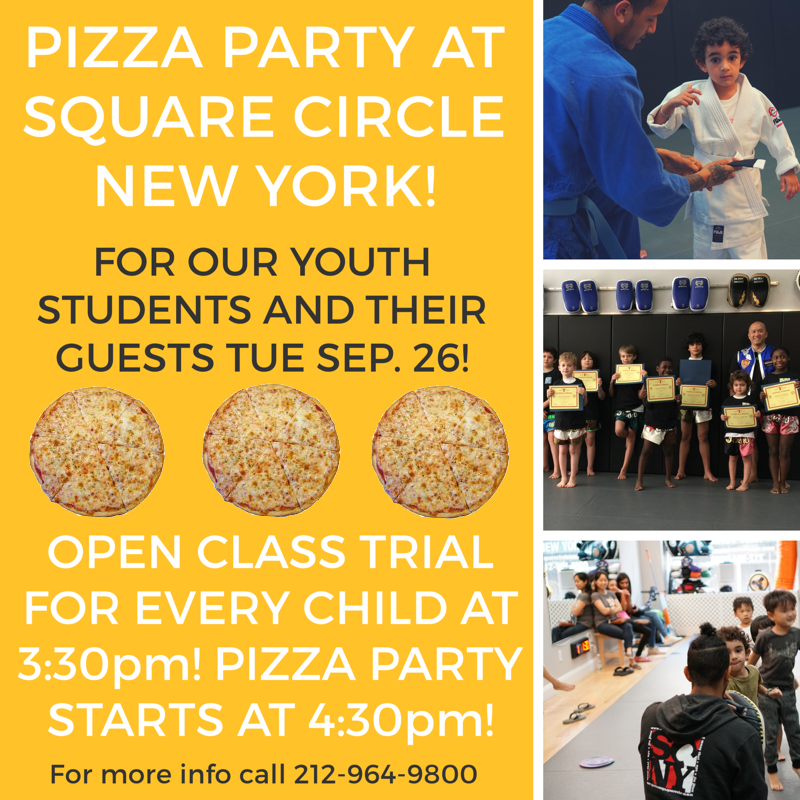 Sep. 23, 2017 – Next Tuesday September 26th starting at 4:30pm, we are having a pizza party for all of our Youth Muay Thai and BJJ students! Each student is able to bring a friend to the event! The guest child must be accompanied by their parent in order to fill out simple paperwork before the event starts! We are planning to open the 3:30pm Muay Thai class to all ages and to all the visiting guest children! If your child has class that day during the 3:30pm time slot and they would like to come to the party afterwards, please feel free to stay after class and take part in the fun and games! Everything will be provided for the party. Food, drinks and plates/napkins will be readily available! Students will need their workout gear and bring their gloves since there will be fun, light training in the beginning. Guests only need to have comfortable workout clothes to train, play and eat. Guests do not need gloves. To have the most fun possible, we would love to extend a warm welcome for your child’s guest who hasn’t been to the school before. If you already know who your child’s guest is, please let us know so that we can properly prepare for them to be included in the fun! We look forward to seeing all of you on the 26th. We will have lots of games and prizes for the children to win! Square Circle New York October 2017 Events! Oct. 11, 2017 – We had a normal schedule for Columbus Day, Oct. 9 and all classes on the Monday schedule were open for training for all students and their guests. We are super happy that you all came in to train on the holiday! 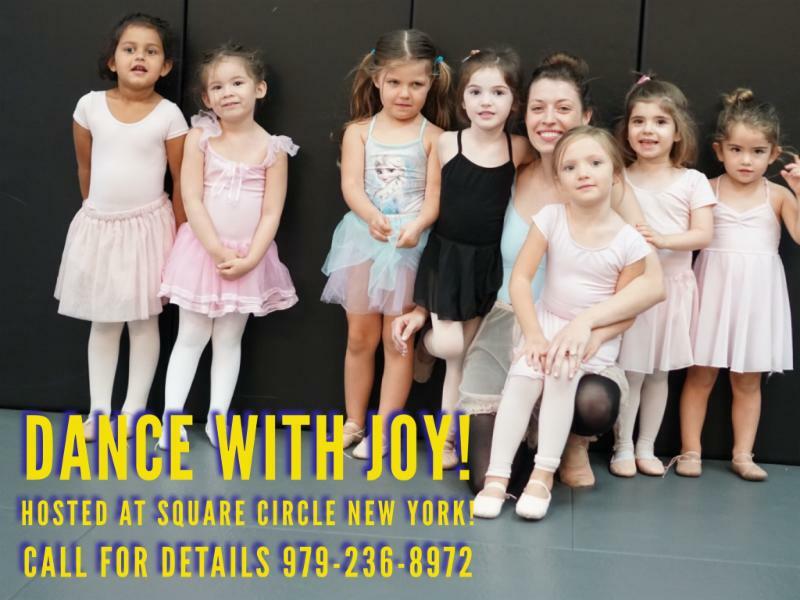 We are proud to announce that we have partnered with Joy McKay and her company, Dance with Joy. She is a ballet instructor teaching little girls the beautiful world of dance. Joy’s 6 week program started October 4 and the last class is November 9. She teaches every Wednesday at 3:30pm sharp and if you are interested in finding out more information for your child or for a friend’s child, please contact Ms. Joy McKay directly at 979-236-8972. The Lehman Prep School is having their 3rd annual Halloween bash for their students and Square Circle New York has been invited to participate! Vlad and Kerry will be at the function working with the children and demonstrating the positive benefits of Muay Thai and BJJ to the youth! On Wednesday, Oct. 31, we are having a children’s Halloween party! All students are encouraged to bring their friends and dress up in costumes! Prizes and awards for Best Costume, etc. Prizes, games, food and fun! More details to follow!! 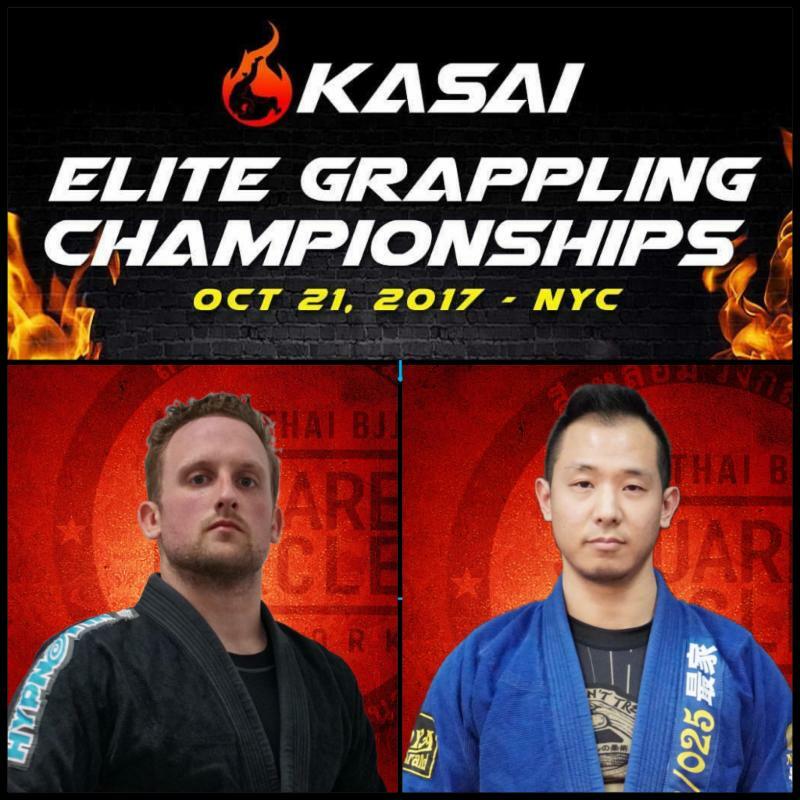 Oct. 21 – Kasai Elite Grappling Championships. 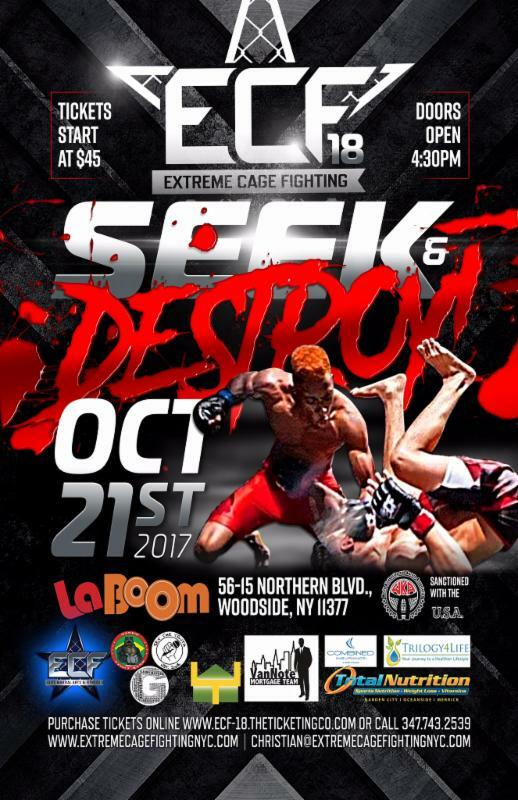 Mark Loyka and Lawrence Louie will represent SCNY at this BJJ event. Venue location is Baruch College and address is 55 Lexington Avenue, NYC. Oct 21 – ECF 18. Kru Rob is working with Anthony Andreocci and will be the striking coach for Ilias “Eli” Faquiri’s MMA debut on this promotion. Eli is representing SCNY at this event. Venue location is La Boom and address is 56-15 Northern Blvd., Woodside NY. Nov 03-05 – USMTO East Muay Thai tournament. Roberto Suarez and Edward Lin are representing SCNY at this Muay Thai event. Venue location is SUNY College at Old Westbury and address is 223 Store Hill Rd., Old Westbury, NY 11568. Nov 18 – IBJJF Pro Championship. Bradley Alvelo is representing SCNY at this pro level event. Venue location is Nat Holman Gym (CCNY) and address is 160 Convent Ave., NY NY 10031. Several Muay Thai, BJJ and MMA events / tournaments happening through the last few months of 2017. Please contact Kru Rob directly for eligibility. Last Muay Thai Class with Coach Lakshmi Tuesday 6:30pm September 19 – Party Afterwards! Sep. 14, 2017 – We are sad to announce that Coach Lakshmi Bose will teach her last Muay Thai class next Tuesday, September 19 at 6:30pm. She will be attending univiersity in the UK to further advance her studies abroad. We wish her all the best! Her last class is OPEN to all members! Please RSVP if you wish to train at 6:30pm that Tuesday evening! Afterwards, we will have a small going away party to wish her all the best! Please feel free to contribute some drinks and small party munchies! 7:30pm Advanced Muay Thai and 8:30pm Muay Thai Sparring are CANCELLED due to the party starting promptly at 7:30pm. Square Circle New York September 2017 Events! Aug. 23, 2017 – We hope you enjoyed your summer! Fall is almost here with September closing in! We have a few announcements to make for September and we hope that you are as excited as we are! To help celebrate our five year anniversary at the Fulton Street location, we are happy to announce that during the month of September, Muay Thai lunch hour times Mon-Thu at 12pm are OPEN for ALL members and guests! Visitors interested are also welcome to come in for the open training. No experience is needed! Bring gloves and be ready to work! For more details and information, contact the desk at 212-964-9800. For Labor Day weekend, Friday Sep. 1 is a normal schedule day, and we have an early close Saturday Sep. 2 at 12pm after the 11am BJJ group class and the school will be closed Monday, Sep. 4 in observance of Labor Day. Experienced students returning to the program have the option to assist as mentors in all the classes! We would like to welcome Kerry Landgarten to the SCNY Family as our new Youth Martial Arts Instructor. He has trained for several years at Brooklyn BJJ and holds a purple belt under professor Brian Glick at his academy. Kerry also has over 5 years of Muay Thai training and over 2 years of youth instruction experience. We are excited to have him on the team! Please ask the desk or instructors if there are any questions on the above events or schedule changes.